Knurled Nuts | Splined Nuts | Electrical Hardware Nuts | Cal Fasteners, Inc.
Cal Fasteners stocks knurled (spline) nuts in a range of standard sizes: 5/16-18, 3/8-16, and 1/2-13 are standardly in inventory (More sizes are available). 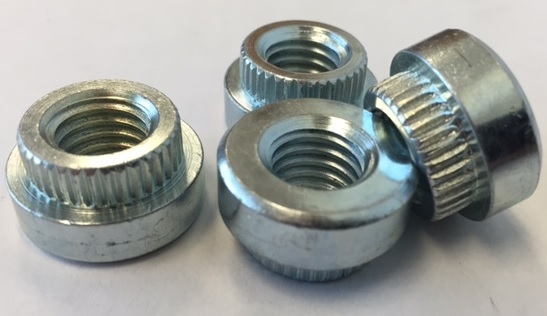 Designed to press into the material they’re fastening and lock in place, these nuts are made from high quality materials and precision manufactured for a perfect fit. Common uses include panel mounts, home hardware, tension adjustment hardware, and electrical applications. The unique design of these nuts helps lock parts in place a la “self clinching” fasteners. We also sell corresponding knurled bolts in assorted sizes. Request a quote on spline nuts, or contact Cal Fasteners to learn more.